This fun card can be for either a little girl or a boy who is having a special birthday and who loves giraffes. The card is made from yellowy orange card stock. The next layer is a fun paper with zoo animals on it and sitting in the center of the card is a wooden yellowy orange giraffe. 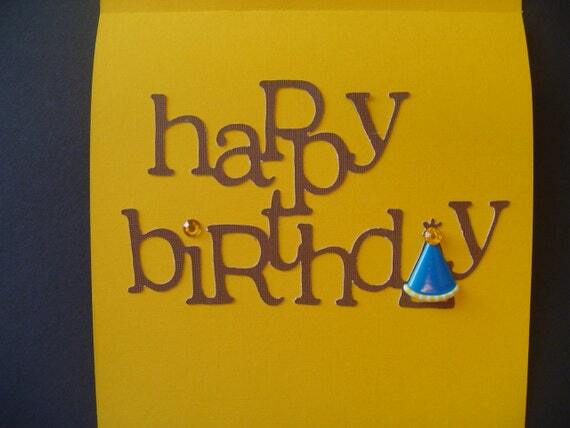 The inside is yellow and there are brown cut out letters spelling out, "Happy Birthday". There is a golden colored gem over the letter "i" and a party hat over the "a" in birthday. The card measures 6" x 6" and comes with a homemade white envelope that has been lined with the same zoo paper. There is a giraffe sticker to use for envelope closure. The card, envelope and sticker are enclosed in a plastic sleeve for it's protection.